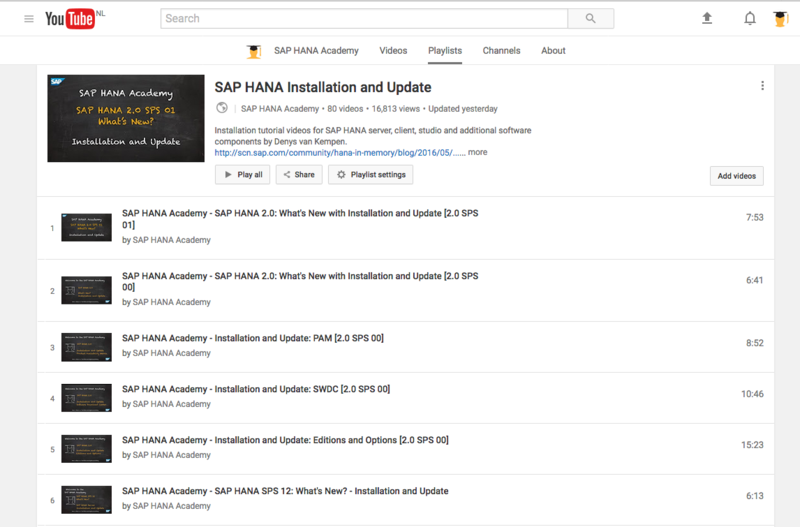 In the upcoming weeks, we will be posting new videos to the SAP HANA Academy to show new features and functionality introduced with SAP HANA 2.0 Support Package Stack (SPS) 01. For those already familiar with the multi-tenant database operation mode, SPS 01 will not introduce a lot of new functionality in the domain of installation and updates. However, for those that have not yet taken advantage of multi-tenancy, it may come as bit of a cold shower as MDC is now the standard and only operation mode. 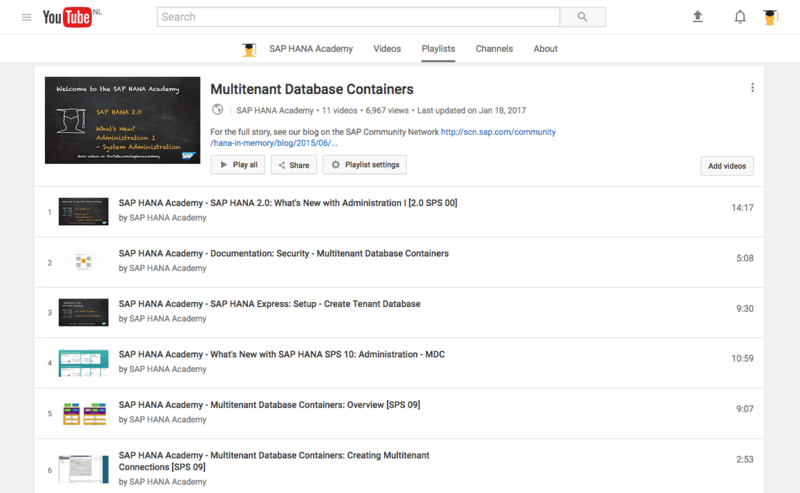 MDC was introduced with SAP HANA 1.0 SPS 09, back in November 2014. This added a new deployment type to the list. As running each and every SAP application on a dedicated SAP HANA system was not always the most cost-effective solution, alternatives had come up that each posed its own challenges. Multiple Components One Database (MCOD) and Multiple Components One System (MCOS) both solved part of the puzzle but at the cost of either security or performance. It is the classic dilemma: do you want it cheap, fast or good? Pick two. Compared with running a dedicated HANA system, the choices with MCOS and MCOD were: secure, performing or cost-effective. For those not familiar, the MCOx concepts are older than HANA and came from the ABAP world. There are two notes that document the restrictions for running this in production. MDC graciously solved the dilemma as it is cost-effective, secure and performing. So it comes as no surprise that for HANA 2 it will be the standard and only operation mode. Please note that there are no changes with regard to MCOS support but it will be a bit more like MC²OS as you will now have two systems with multiple tenants each on each system (MCOS). Andrea Kristin explains the concepts in her blog, so I will skip that part and just look at some of the practical consequences. 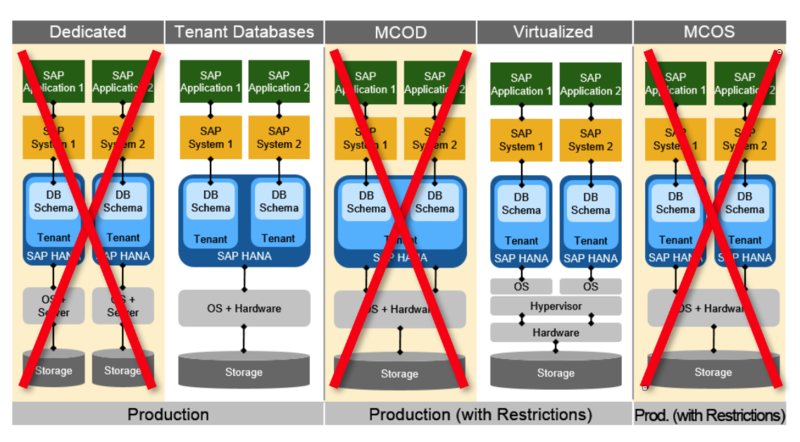 The SAP HANA lifecycle manager no longer prompts to select the database mode. Here we see both version SPS 00 and SPS 01, side-by-side. Unfortunately, this also means that we have lost a UI to set the isolation mode to high. When you install the SAP HANA server on the command line you can pass the isolation mode as a parameter (or use a configuration file). However, when using the graphical installer, this is not an option. Of course, you can always change the isolation mode later on but this is not trivial. 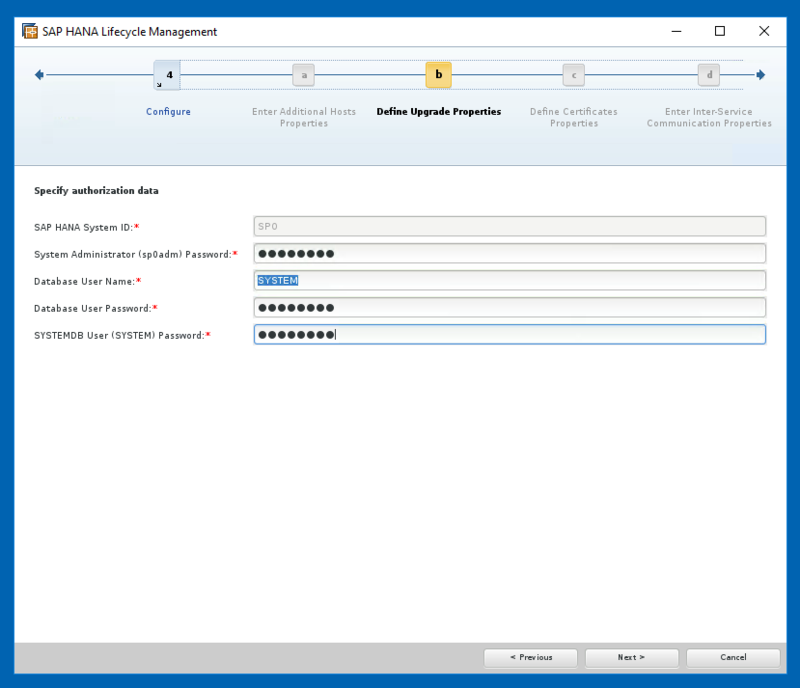 The SAP HANA lifecycle manager now prompts to enter the credentials (OS and database superuser) for the original single-container database and for the new system database. The update, in fact, involves flagging the original database as tenant (the SID is now also the tenant database name) and just adding a system database. Database size will stay roughly the same, performance is not impacted. The upgrade is quick and no user data is changed or migrated. Existing applications do not need to be changed (…) The default tenant database runs on the same ports as the single-container system and is also accessible through the same URLs. The note is also mentioned in the Review & Confirm step. 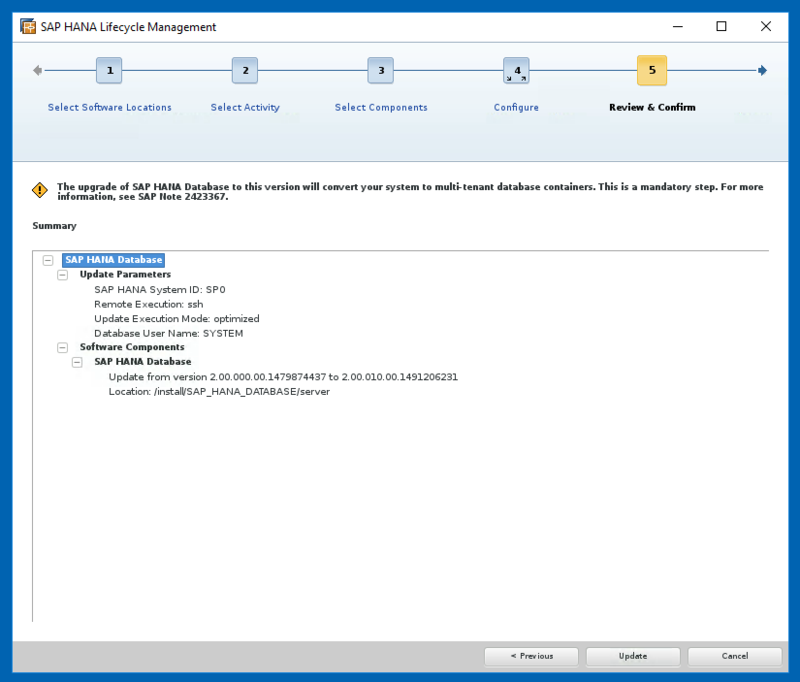 The resident SAP HANA lifecycle manager (post-installer) no longer includes the option to convert a system to multitenant (as all systems for this version already are …). It would be nice, in the next release or so, if we had an option here to set the isolation mode for multi-tenancy. Again, both version SPS 00 and SPS 01, side-by-side.